Across the United States, the growing size and complexity of electrical systems has led to increased exposure to electrical hazards, and arc flash hazards in particular. Arc flash incidents, which involve the release of thermal energy from an electric fault, are less common than other electrical safety incidents, but they are much more likely to cause severe injury or death. Accordingly, the electric industry has focused on developing new safety management tools, procedures and technologies. This focus has significantly decreased workplace fatalities from electrical incidents in the U.S. Yet, the fatality rate in the U.S. remains 3.8 times higher than in the United Kingdom, as cited in “Bringing Attention to Residual Risk: Psychology of Warning, Administrative Controls and PPE,” by Floyd & Floyd. Many safety experts believe this is because the U.K. has begun to emphasize arc flash prevention, while the U.S. continues to focus on mitigation. Terminal and pipeline facilities in the oil and gas industry are often susceptible to arc flash hazards. Most of these projects in the U.S. still follow a mitigation strategy, says Tim Howd, a senior electrical and instrumentation engineer at Burns & McDonnell. The emphasis is on reducing the severity of arc flash incidents when they occur, and it often is considered only at the end of a project. By comparison, engineers in the U.K. focus on preventing arc flash incidents through the use of the hierarchy of controls. Mitigation strategies in the U.S. are built around lower-order controls, like safe work practices and the use of personal protective equipment (PPE). 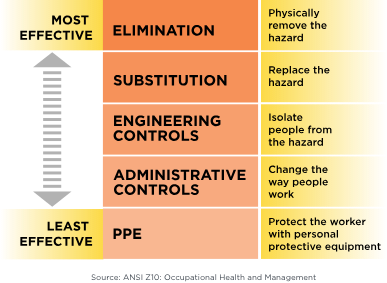 Preventive strategies use higher-order controls, such as isolating people from the hazard, replacing the hazard with a less dangerous alternative or physically removing the hazard. To be most effective, arc flash prevention needs to be addressed and engineered during the design phase of every terminal and pipeline project. Evaluating arc flash hazards early allows engineers to build in multiple layers of protection using the hierarchy of controls. Some layers are designed for mitigation. For example, in the event of an arc flash, arc-resistant equipment contains most of the energy and redirects it to a safe location. Other layers — like active arc flash detection, neutral grounding resistors, arc quenching devices and even preventive maintenance — are more often overlooked, but are critical in preventing electrical system incidents. Safety management professionals have encouraged the application of higher-order controls to reduce electrical hazards since “ANSI Z10: Occupational Health and Safety Management Systems” was published in 2005. Adoption of this approach has been inconsistent. But with publication of the 2018 edition of “NFPA 70E: Standard for Electrical Safety in the Workplace,” which added sections referencing ANSI Z10 and the hierarchy of controls, this is beginning to change. To learn more about using the hierarchy of controls to prevent arc flash hazards, check out a recently completed white paper here.